For a good part of the 19th century, factories and large buildings got their electricity from generators located in their basements. This method required a lot of maintenance and upkeep from the factories and companies hosting the generators, and the power supply was often unreliable. Then, in the 1890s, the first public power plants were built. Factories and buildings received a more efficient, cleaner, and cheaper supply of electricity compared to their on-site generators. This advancement marked a significant change, and had a huge impact on the future of, the electricity industry. We are now seeing the same change happening in the software industry, thanks to the rise of Software-as-a-Service (SaaS). The way software is delivered to users has changed a lot over time due to various technological advancements. In the early days, software was delivered from the software company to the user via floppy disk, then by way of CD, then when the popularity of the internet took off, software companies started offering users the option to download their software. The software delivery methods over time. While the download method, or even the CD-delivery method, is still popular among some software companies, SaaS is fast becoming a smart and convenient way for vendors to deliver their product to consumers and businesses. Before looking at the growth of cloud computing and SaaS, it’s important to clear up a common misconception that they both relate to the same thing. Cloud computing is a network of remote servers connected to the internet, used to store, manage, and process data. 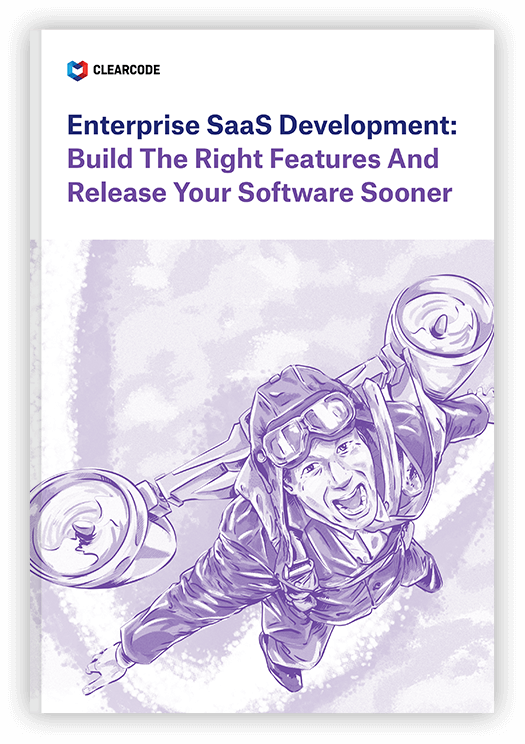 SaaS is a software licensing-and-delivery model whereby a user or company pays a subscription to use the software. Unlike other methods of software delivery that usually have to be downloaded or installed on user’s computer or company’s server, the software is stored remotely on a server and is accessed via the internet. SaaS is just one part of cloud computing; it also includes other areas such as platform-as-a-service (PaaS) and infrastructure-as-a-service (IaaS). Below is a very brief explanation of the difference between SaaS, PaaS, and IaaS – with some examples for each. The shift from software-as-a-product (SaaP), or even on-premises software, towards cloud-based services (i.e. SaaS) has been increasing steadily over the past few years, and is set to rise even more in the future as consumers and enterprises continue to embrace the new method of software delivery. The report also suggests that the enterprise-applications market will be SaaS-based and generate $50.8 billion in revenue by 2018. Another report from Cisco illustrates the growth of SaaS, PaaS, and IaaS. The growth of SaaS, PaaS, and IaaS. Source: Cisco Global Cloud Index: Forecast and Methodology, 2013–2018. With this increase in SaaS solutions, it’s not surprising to see many public and private SaaS companies grow more than their Software-as-a-Product counterparts. 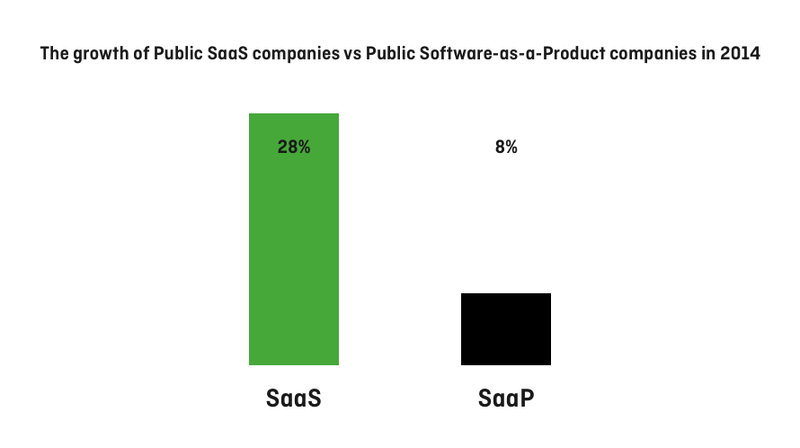 According to Software Equity Group, Public SaaS companies grew at 28% in 2014 versus 8% for Software-as-a-Product companies (as illustrated in the image below). The growth difference between public SaaS companies and public SaaP companies. Source: The Software Equity Group. The ability to access the software on any device, at any time, anywhere (without having to manually download it or apply upgrades). Better affordability. Users pay on a subscription basis rather than paying a big lump sum upfront, therefore making it more affordable. Instant access to software upgrades and fixes (the SaaS vendor just upgrades the software on the server side and delivers to all its customers at once). For companies, there are a number of advantages to using SaaS compared to the traditional on-premises software. Much faster deployment of the solution in the company (days rather than months, as it essentially only requires setting up user accounts and training users, with no work needed to install software or place physical servers in the company, etc). Higher reliability (SaaS vendors will maintain high availability, scalability, distributed infrastructure, etc). Compatible with any platform that has a modern web browser (Windows, MacOS X, Linux, iOS, Android, etc). A decrease in software piracy. A centralized SaaS platform is easier and cheaper to maintain than the traditional desktop software model. SaaS can help companies reduce software piracy, as it is much harder to pirate cloud-based software. Software vendors can easily push out upgrades and security patches to make the software secure for every user. Source: Why SaaS Companies Grow Faster than Software Companies, Cloud Strategies, cloudstrategies.biz. For most software providers, building software involves big projects, a big budget, and a long development time. The problem is that both the consumer and enterprise environment are changing too fast, and by the time the software is released, the user’s needs and requirements will have changed. The new way of building software requires a combination of the SaaS delivery model and an approach that many successful startups embrace when building their software. In recent years, there has been a big shift in the way software solutions are built. Traditionally, software applications and platforms were big IT projects that required a lot of resources, time, and money. Nowadays, mainly due to high project-failure rates and a highly competitive software industry, more and more businesses, including startups, are looking for newer methods. An increasingly popular way to build software applications and platforms is to build an MVP. A minimum viable product – the minimum set of necessary features needed to deliver users the most value possible, and to learn the most we can about them, while also delivering the highest return on investment versus risk. Release a working version of their application or platform to initial users sooner. Gain valuable feedback to help shape the features and functionalities. Minimize risk by identifying if their idea solves a problem and potential challenges. Raise funding by presenting a working version of their idea to investors. While MVPs are traditionally associated with startups, they can also benefit large corporations. Another important benefit of starting with an MVP for corporations is that it can significantly reduce the chance of project failure. A recent report from the Standish Group found that the smaller the project, the more successful it was. Source: The CHAOS Manifesto 2013, The Standish Group 2013. Small projects are defined as projects with less than $1 million in labor content. Large projects are defined as those with more than $10 million in labor content. A 2012 Gartner user survey also backs up the “small is better” theory, as it discovered that the larger the IT project, the more likely it is to fail. Source: Lars Mieritz, ‘Gartner Survey Shows Why Projects Fail.’ Gartner, www.thisiswhatgoodlookslike.com, June 2012. By designing prototypes and building early working versions of software, the software development team is able to test the performance, iron out any usability issues, and fix bugs – which all enable them to move through the project faster. If a project is small, the software vendor and development team are able to validate the original ideas at the beginning of the project and then move on to the other stages of development. The validation stage in complex and lengthy projects doesn’t usually occur until later in development because of its size. By that time, it is too late to change or adjust the scope and direction of the project, which results in budget blowouts and extreme time extensions. Smaller projects can be released sooner to users, which allows the software vendor to make iterations in the software’s roadmap based on feedback and data gained from initial users so the final product is in line with its users’ needs and requirements. The way a software project is managed can have a big impact on its success. By far, the two most common project-management methodologies for developing software are agile and waterfall (traditional). The agile approach to software development focuses on minimizing risk, optimizing time spent on developing the application, and producing a working product as soon as possible. This type of software development allows developers to foresee and react to any issues that may arise along the way and set the project on a different, more effective course of development. This model is fast becoming the project-management method of choice, largely due to its focus on optimizing development time and producing an operational application in the shortest time possible. The traditional method as a software project-management model dates back to the 1950s and is based on the project-management method used in manufacturing and construction industries. It was developed in response to the lack of other models available at that time. This model calls for developing applications one stage at a time and is considered very rigid and linear. The project starts at the first stage and then, once completed, moves onto the next stage without the possibility of turning back to previous stages. The difference between the agile and waterfall development process. Even though the above-mentioned processes and methods are helping companies deliver more successful projects, increase revenue, and save time, the real challenge lies in changing the mentality of corporate executives, as they are more accustomed to working on larger, full-scale IT projects. There have been a number of notable software vendors that have incorporated the SaaS model into their services, or completely moved to SaaS, such as Microsoft. Another company that has made the move from on-premises to SaaS is Adobe with its Creative Cloud Suite. Back in April 2012, Adobe launched Creative Cloud, the SaaS bundle of its most popular software, including PhotoShop, Illustrator, and a few others. This move was considered a big game changer, as Adobe had traditionally provided its products solely on a perpetual software license. While at that time Adobe was still offering its traditional Creative Suite package, new releases of the perpetual software seized in May 2013, therefore signalling its full commitment to only offering a SaaS version of services. 4 million subscribers in just 2.5 years. Source: The SaaS Company that Grew from 0 to 4M Subscribers in 2.5 Years, Tomasz Tunguz, 2015. This large subscription growth is big, even for a giant like Adobe. Adobe’s share price has increased % since launching Creative Cloud. A historical graph of Adobe’s share price illustrates its increase since introducing the Creative Cloud service back in April 2012. Adobe’s share price over time. The red line represents May 2012. Source: Google Finance. There is little doubt that the success of Adobe in the recent years has been the result of its Creative Cloud service – mainly due to the fact that the company is now only offering the SaaS version. Adobe’s success story is providing many software vendors, both existing and new, the motivation and inspiration needed to either introduce a cloud-hosted version of their software or solely provide a SaaS version. 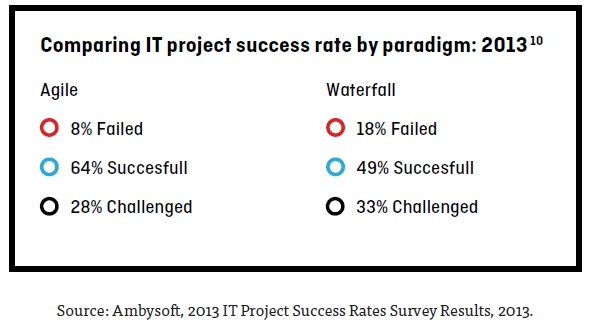 Agile vs Waterfall: Which Method is More Successful?